d. Increases linearly with electric field at low values of electric field and gradually saturates at higher values of electric field. 12. An n-channel JFET has IDSS = 1 mA and VP = -5 volts. Its maximum Transconductance is ……..
16. Two identical silicon junction diodes, D1 and D2 are connected back to back as shown. 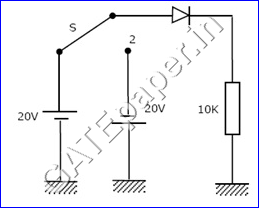 The reverse saturation current IS of each diode is 10-8 Amps and the breakdown voltage is 50 volts. 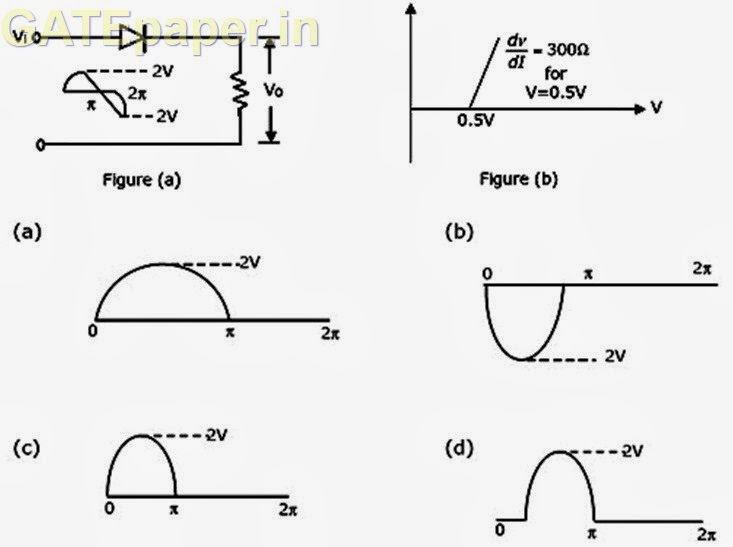 Evaluate the voltage VD1 and VD2 across the diode D1 and D2 by assuming KT/q to be 25mV. 17. Calculate the capacitance of a circular MOS capacitor, of 0.5 mm dia and having a SiO2 layer of 80 mm thickness, under strong accumulation. Assume the relative dielectric constant of SiO2, Ԑr = 4 and Ԑo = 8.854 X 10-14 F/cm. calculate the breakdown voltage of the capacitor if the dielectric strength of SiO2 film is 107 V/cm. 18. The Fermi level of an n-type germanium film is 0.2 eV above the intrinsic Fermi level towards the conduction band. The thickness of the film is 0.5 µm. Calculate the sheet resistance of the film. 3. The forward dynamic resistance of a junction diode varies ……………… as the forward current. 4. The transit time of the current carriers through the channel of an FET decides its ……………. characteristics. 8. Show that the minimum conductivity of an extrinsic silicon sample occurs when it is slightly p-type. 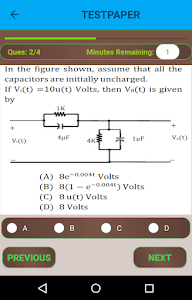 Calculate the electron and hole concentrations when the conductivity is minimum. Given that µn = 1350 cm2/volt-sec, µp = 450 cm2/volt-sec, and the intrinsic carrier concentration, ni = 1.5 X 1010 cm-3. 9. In the common emitter amplifier shown, the transistor has a forward current gain of 100, and a base to emitter voltage of 0.6 volts. Assume ICO to be negligible. 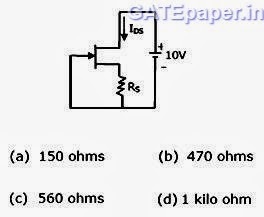 Choose value for R1 and R3 such that the transistor has a collector current of 1 mA and a collector to emitter voltage of 2.5 volts. 10. A typical CMOS inverter has the voltage transfer characteristic (VTC) curve as shown in the figure. Evaluate the value of the inverter threshold VINV, which is the value of the input at which Vo falls by ΔVo = VTn + VTp. 1. A semiconductor is irradiated with light such that carriers are uniformly generated throughout its volume. The semiconductor is n-type with ND = 1019 cm-3. If the excess electron concentration in the steady state is Δn = 1015 cm-3 and if τp = 10 µsec (minority carrier life time), then the generation rate due to irradiation is …………. 4. In a transistor having finite β, the forward bias across the base emitter junction is kept constant and the reverse bias across the collector base junction is increased. Neglecting the leakage across the collector base junction and the depletion region generating current, the base current will………….. (Increase / Decrease / Remains constant). 6. The JFET in the circuit shown has an IDSS = 10 mA and VP = 5 volts. 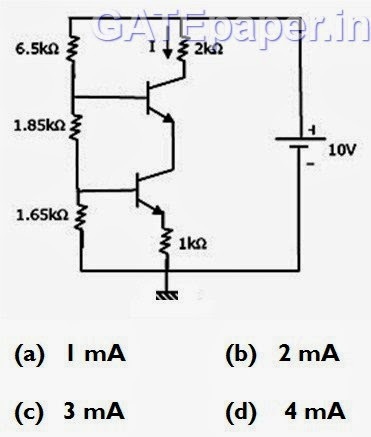 The value of the resistance RS for a drain current IDS of 6.4 mA is …………….. (Select the nearest value). 9. A PNP transistor shown in figure has uniform doping in the emitter, base and collector regions, where in the doping concentrations are 1019 cm-3, 1017 cm-3 and 1015 cm-3 respectively. The minority carrier diffusion lengths in the emitter and the base regions are 5 µm and 100µm respectively. 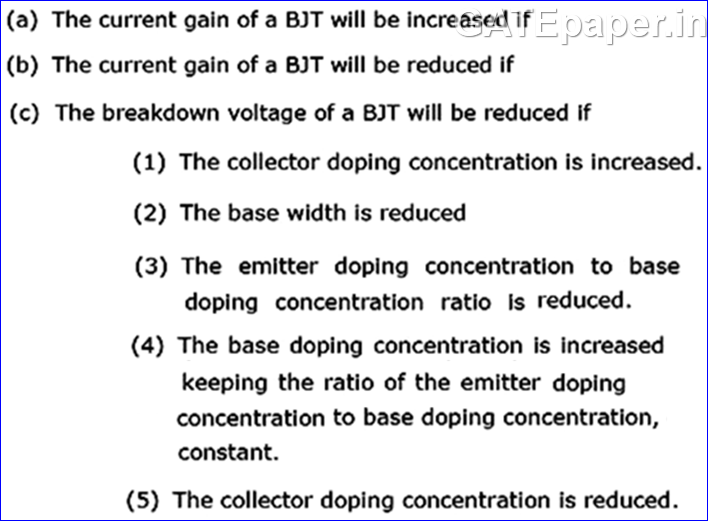 Assuming low level injection conditions and using law of the junction, calculate the collector current density and the base current density due to base recombination. In all the regions of transistors, Dp = 8 cm2/sec, Dn = 16 cm2/sec, ni = 1.5 X 1010 cm-3, KT/q = 26 mV and q = 1.6 X 10-19 C.
10. 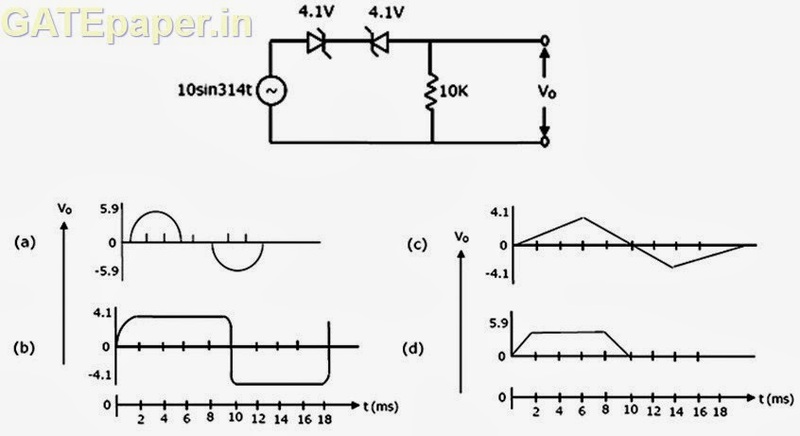 An n-channel MOSFET having a threshold voltage of 2 volts is used in the circuit shown in figure. Initially the transistor is OFF and is in steady state. 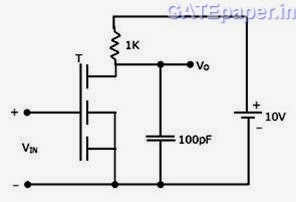 At time t = 0, a step voltage of magnitude of 4 volts is applied to the input so that the MOSFET turns ON instantaneously. 3. M in the figure shown is a rectifier type 200 volts full scale voltmeter having a sensitivity of 10 KΩ/volt. 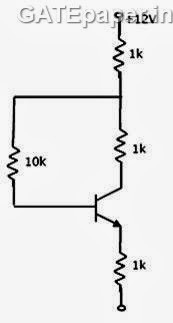 What will be the reading in M if the source voltage VS is a symmetrical square wave of 800 volts peak to peak ? 4. In the figure, A1, A2 and A3 are ideal ammeters. If A1 reads 5 Amps, A2 reads 12 Amps then A3 should read……..
7. The reverse saturation current of the collector base junction (ICBO) of a BJT is found to be 10 nA at low collector voltages. The low current amplification factor (α) is 0.98. Find out the change in collector current with its base open (ICEO) when the collector voltage is increased such that α increases by the 1 %. 1. A silicon sample is uniformly doped with 1016 phosphorous atoms/cm3 and 2 X 1016 boron atoms/cm3. If all the dopants are fully ionized, the material is ………..
2. An n-type silicon sample, having electron mobility µn twice the hole mobility µp, is subjected to a steady illumination such that the electron concentration doubles from its thermal equilibrium value, as a result, the conductivity of the sample increases by a factor of ………..
3. The small signal capacitance of an abrupt P+N junction is 1 nF/cm2 at zero bias. 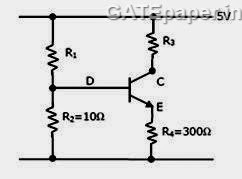 If the built in voltage is 1 volt, the capacitance at a reverse bias voltage of 99 volts is equal to ………. 5. Discrete transistors T1 and T2 having maximum collector current rating of 0.75 Amp are connected in parallel as shown in figure. 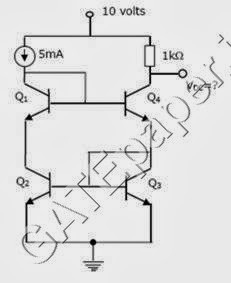 This combination is treated s a single transistor to carry a total current of 1 Amp, when biased with self bias circuit. When the circuit is switched ON, T1 draws 0.55 Amp and T2 draws 0.45 Amp. If the supply is kept on continuously, ultimately it is very likely that…………. 6. 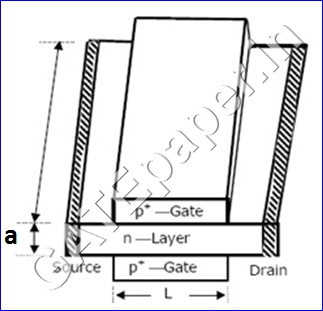 The built in potential of the gate junction of an n-channel JFET is 0.5 volts. The drain current saturated at VDS = 5 volts when VGS = 0 volts. The pinch off voltage is …………..
8. In the figure shown, the input Vi is a 100 Hz triangular wave having a peak to peak amplitude of 2 volts and an average value of zero volts. Given that the diode is ideal, the average value of the output voltage Vo is ……………..
9. In the figure shown, the n-channel MOSFETs are identical and their current voltage characteristics are given by the following expressions. a. The current density in the diode, assuming that the diffusion coefficient of holes is 12 cm2/sec. b. The velocity of holes in the n-region at x = 0. 11. It is required to use a JFET of figure as linear resistor. The parameters of the JFET are as follows. W = 100 µm, L = 10 µm and a = 2.5 µm. The doping in the n-layer is ND = 1016 cm-3 and the electron mobility is 1500 cm2/V-sec. the depletion layer width of each junction due to the built in potential is 0.25 µm. The two P+ gate regions are connected together externally. The resistances of the regions outside the gate are negligible. 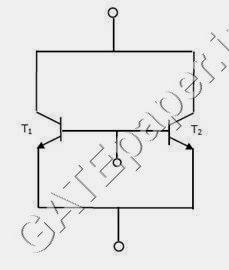 Determine the minimum value of the linear resistor which can be realized using this JFET without forward biasing the gate junctions. The following are the Public Sector Unions (PSUs) that are considering GATE percentile for recruiting jobs under engineering categories.